The Florida Keys Wild Bird Center down in Tavernier, is a great place to visit for numerous different reasons. The first, which I mention on many pages is it is completely free to visit. The FKWBC is a truly interesting and humbling experience, which I for one feel they should charge at least a few dollars to step through its doors. But that is just my point of view. However, the centre doesn’t ask for an admission fee, but is more than grateful for the donations that are made by the visitors who walk out with a huge admiration to the staff that give so much of their time, and expertise to these poor creatures. Hopefully you will feel the same way after visiting and will decide against holding back your dollars for a few drinks that evening, and instead make a real difference to the Florida Keys wildlife. The place was first created by a dedicated nature lover by the name of Laura Quinn. 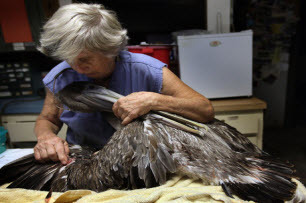 For over 35 years, the lady would walk up and down the boardwalks through the centre reviewing and caring for the ever increasing influx of wild birds that would be brought to the center in some state of ill health. And her impromptu speeches and sharing of knowledge with visitors and workers ensured that the center would continue long after her sad death in 2010. The place has her spirit running through it, and for all of us, we are certainly glad that it does. It's Not Just The Sick That Comes To Visit...The Hungry Too! Also known as the FKWBC, the center is 100% dedicated to finding sick, or injured or even orphaned wild birds across the Florida Keys and nursing them back to health. They can be found anywhere in the Florida Keys not just in Tavernier, and all of them will have some tail to tell (if of course they could speak) as the damage caused to them...often needlessly is a real eye opener. A visitor of any age will love this place and find it fascinating as they are shown how "Mans natural Hazards" can cause huge problems to the birds, who get entangled in nets, anglers fishing lines or simply fish hooks. The birds can be in great pain, and need a place that can look after them until freeing them back into the wild again. And they really couldn’t find a better place to go. The Center has three simple objectives to base their daily activities on. 1. To demonstrate high standards in how they care for animals, rehabilitate them, and nurses rescued, sick or wild birds orphaned from their parents. 2. To teach the general public about how important all our birds, not just the ones that live here are to the Florida Keys, and further up the road the in the Everglades too. 3. To provide simple examples in regards to treating birds humanely, for others to learn and follow. What Will I Find At The Florida Keys Wild Bird Center? Of course you will find birds, birds and more birds. From Eagles, to Comorrants, to Kingfishers and Ospreys there is no doubt you will get up and personal with many different species of birds. But unlike most “Hospital type” places where you might expect the patients to be held in small confined spaces, throughout the center, aviary’s are setup to allow the birds to get back to full strength. They can hop about, flutter around, and test their muscles out before going out into the big wide world again. Visitors can walk through the cages, on specially constructed boardwalks that allow you to pass by their natural habitats. You may think that it is just the sick birds that you will see, but with the amount of food being handed out on a daily basis,it's not surprising that the wild birds who are not in the cages at the center hang out there too. So make sure you hang around when the afternoon feeding session occurs, as those pelicans are a sight to be seen. They can be really pushy when it comes to food. You can also visit the Bird Hospital which is just up the road from the Florida Keys Wild Bird Center. This is where the work really begins, and the sick and damaged first are brought. Over 40,000 visitors walk through its doors each year, to see first hand over 1,000 birds from 80 different species begin the long road to recovery. And this is where you will be dipping into your wallets to make your donations, as it is quite amazing the charitable work this place does. Welcome To The Florida Keys Wild Bird Center! How Long Should I Plan To Be In The Center? This is not a place that is going to take hours and hours to get through. You can go at your own pace, chat to staff, and take your time and about one and half hours should be enough. When I went, my kids took great delight in the place, even though it was a bit smelly which they also took great delight telling everyone about. So about an hour to two hours will be about the maximum time that you will need to allocate for your visit. How Can I Get To The Florida Keys Wild Bird Center?